To meet contemporary trends and competitive demands, we have gradually turned toward diversified developments from the past conventional industry. We own a professional design team and it is our belief that a good display rack can better present the characteristics and value of merchandise. We care about how to design aesthetically pleasing and useful display racks that meet customers' needs. We also emphasize creative retail store / shop design ideas in order to provide customers with the most unique product design and production services. It is our hope that in both conceptual design and mass production, we can all build a collaborative and mutually beneficial relationship with customers. 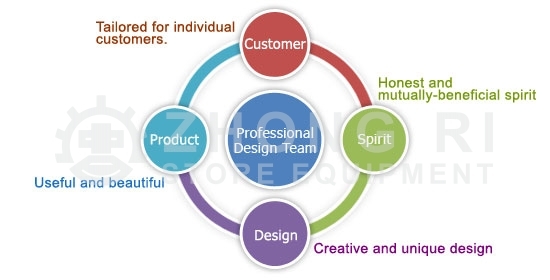 The design department established to meet market development needs is capable of designing all-round customized and unique products. Design team = enthusiasm + expertise + carefulness + brainstorming + detail-oriented. One person's power is just right. A team's power is infinite. Our design, creativity, and expertise can bring about greater economic benefits for our customers. We value customers' and consumers' substantial needs and create ideal shop equipment and settings accordingly. Professional design shall take into consideration not only the features of the products and the relationship between merchandize and consumers but also the style, color, material, and their agreement with the exhibition floor or shop as a whole. The innovative design ideas offer customers the most unique product design and production services. Copyright© 2016 ZHONG-RI STORE EQUIPMENT CO., LTD.All rights reserved.